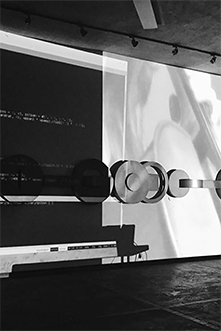 Leviathan is an interactive musical system still under development and experimentation that links musical and visual creation resulting in a live electronics piece for Paetzold recorder with live visuals. Leviathan attends performance interactivity but also the historically shaped relationships between the agents involved: composers, performers and computer. The specific indications for Leviathan are a series of indications directly related to the supercollider code control routines. The indications suggest to the performer many actions to change between fixed and variable states interacting with the live electronics. This project works with two elements: real time and fixed time, exploring de differences and similarities between them through three dimensions: technical, musical and conceptual. From a technical point of view, this project is working with a system called “Machine listening”, so the piece can generate itself taking as inputs the sound events from the Paetzold recorder. The same happens with the visuals, there is a video generated in real time, which is mixed and processed with many different effects constructing a very special audiovisual context.